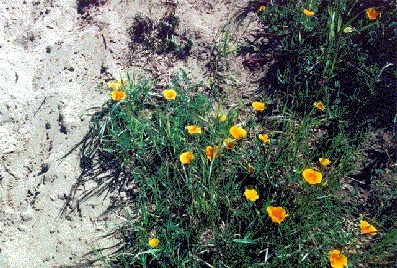 Native California poppies clinging to remnant sand dunes above the Sunset District. Adelbert von Chamisso (1781-1838), a German naturalist of French heritage, visited San Francisco in 1816 with the expedition of Otto Kotzebue, a German captain in the Russian Navy. Chamisso was among the first Europeans to document California's incredible biodiversity. Returning to Europe with hundreds of plant and animal specimens, Chamisso helped assign scientific names to many of our most common and beautiful plants, including the California golden poppy (Eschscholzia californica), named in honor of his friend, Johann Friedrich Eschscholtz, the surgeon on the Kotzebue expedition. Eschscholtz returned the favor by giving Chamisso's name to a lupine, Lupinus chamissonis. What the Bay may have looked like before development. Grizzly bears captured for entertainment: The famous spectacle of a combat between a bear and a bull had been promised to us. On the 21st, ten or twelve soldiers went over to the northern shore, in the shallop [an open boat fitted with oars] of the Mission, in order to capture bears with the lasso... In the evening of the 22nd, the hunters brought in a small bear. 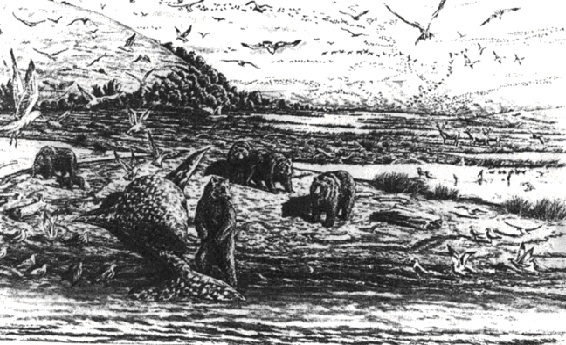 As for the bear which was to fight on the following day, he remained all night in the shallop, having his head and mouth free, contrary to custom, that he might be fresher for the combat... All night, great fires burned on the land at the back of the harbor, the natives are in the habit of burning the grass, to further its growth. Departure: The time for our sojourn in California had ended. On the 26th day of October, on Sunday, after a ride to the Mission, a feast and a parting dinner were given under our tent. The artillery of the Rurik accompanied the toast to the union of the monarchs and the nations, and the health of the Governor. A good missionary dipped his mantle too deep in the juice of the grape, and reeled visibly under the burden... On the 30th, the livestock and a great abundance of vegetables were taken on board; at the same time, the air became thick with numberless hosts of flies. We had taken fresh water on board, which is a difficult business in this harbor, especially in summer, and we had to thank the Governor for a cask of wine from Monterey... Day by day we watched the play of the fog, which, blown eastward by the strong sea-breeze over the bright, sunny land, dissolved and scattered itself everywhere. Singularly beautiful was the spectacle displayed for us at our departure, when the mist would sometimes hide and sometimes unveil the different peaks and valleys of the coast. Natural history notes from another of Chamisso's journals: In the spring, after the winter has granted the earth some moisture, it is true, the hills and meadows are adorned with brilliant irises and other flowers, but the drought soon destroys them. The fog that the prevailing sea breezes spread over the coast dissolve again in the summer above a heated and thirsting earth, and in the fall the land shows only a vista of bare areas burned brown, alternating with bushes pressed pitifully against the soil, and in places with blinding deserts of drifting sand... These deserts serve as the dwelling place for many animals, some of which may still be undescribed. Here they bear the names of known species: little lion, wolf and fox, stag, goats, and rabbits. Their most fearful visitor, however, is the bear, which according to the reports of the hunters is of extraordinary size, strength, savagery, and tenacity of life. He attacks humans and animals even if he is not lacking vegetable forage and gathers in countless packs when dead whales are cast onto the shore... The whales and seals of the north visit this coast. The sea lion is common, the sea otter now nowhere more numerous than here. Birds are present in great variety and amounts, the Oriolus phoeniceus being especially plentiful in endless flights. The Mission Economy: The pious Franciscans who maintain the missions in new California are not trained in any of the arts and crafts that they are supposed to practice and teach here nor in any of the languages that the peoples to which they are sent speak... In each mission every two of them manage a considerable amount of farmland, conduct the religious services, and converse through interpreters, who themselves are Indians, with their charges. All property belongs to the congregation of the mission and is administered by the fathers. The Indian himself does not draw any direct profit from his labor and no wages if, for instance, he is rented out as a day laborer to the Presidio. The Mission, this ration being, draws the penny that he earns. He does not come to know property and is not bound by it. We do not deny the gentleness, the paternal care of the missionaries... But the relationship remains the one described and would, it seems to us, be different only in name if a slaveholder kept them for labor and rented them out at will; he too would feed them... The Indians are dying out in the missions at a rate that is increasing terribly. Their tribe is vanishing. San Francisco contains about a thousand Indians; the number of deaths in the preceding year surpassed 300, while this year it already amounts to 270 (to October), of which 40 occurred in the last month... There is no medical help to be found here, except that a ship's doctor is said to have once taught them bloodletting, and since then this expedient, being applied at every opportunity, hastens death. One disease especially, which, although opinions vary on the subject, the Europeans may well have spread abroad here, claimed its victims without opposition [syphilis].